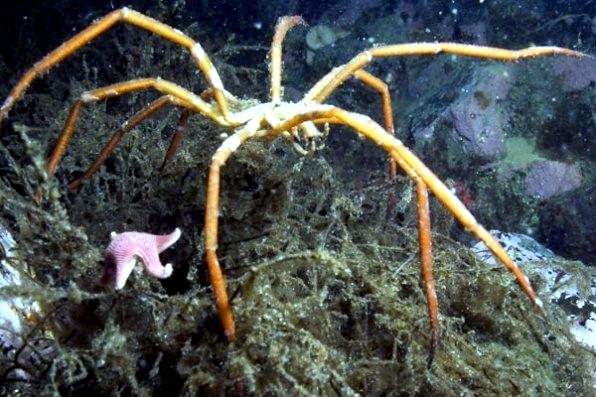 The Giant Sea Spider in the Southern Ocean surrounding Antarctica, are equipped with 8 long legs and a proboscis to match and they grow bigger in these regions than anywhere else in the world. 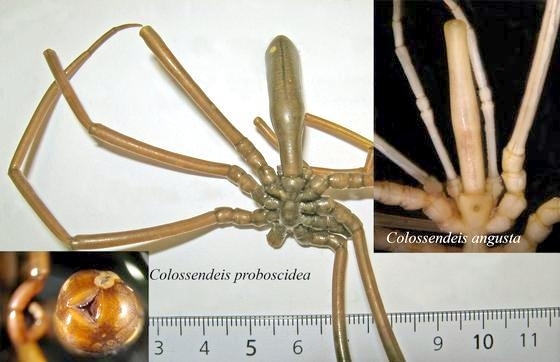 These Giant Sea Spiders are actually pycnogonids, a type of primitive marine arthropod and they grow to massive sizes in a phenomenon known as polar gigantism but scientists don’t know why. 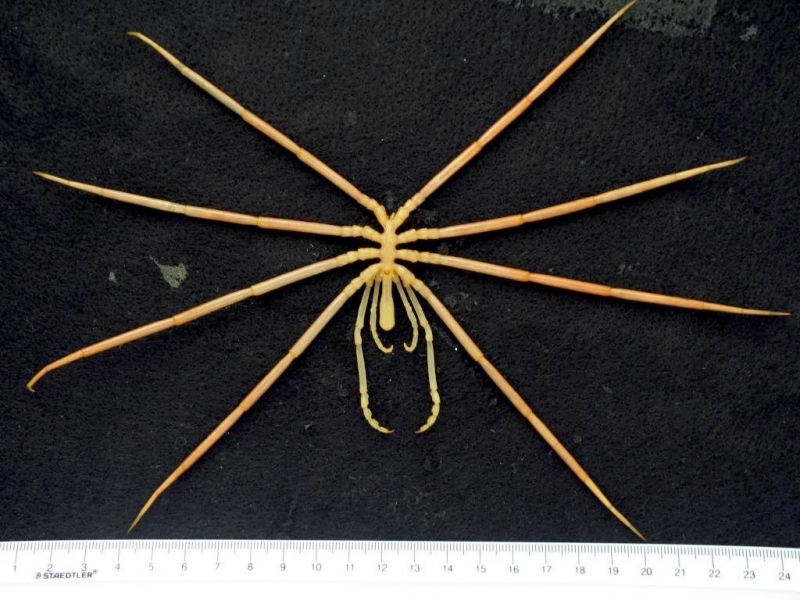 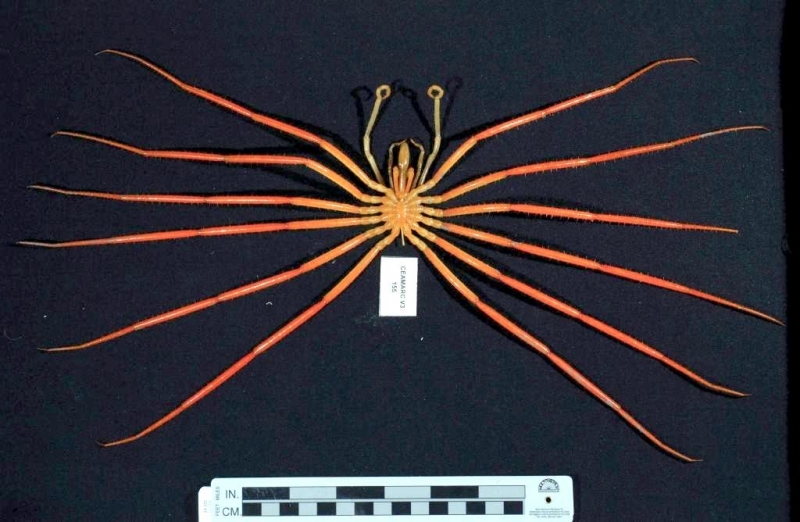 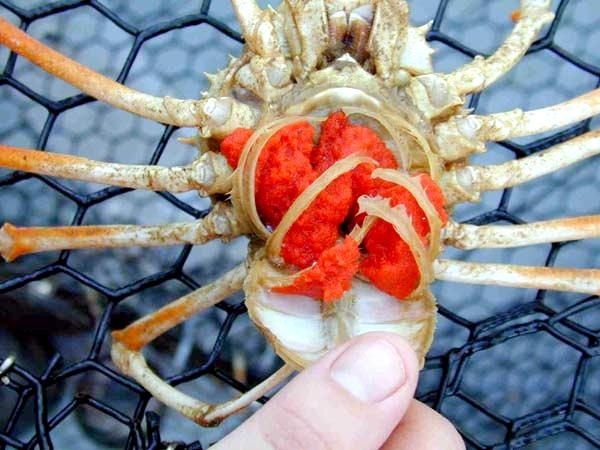 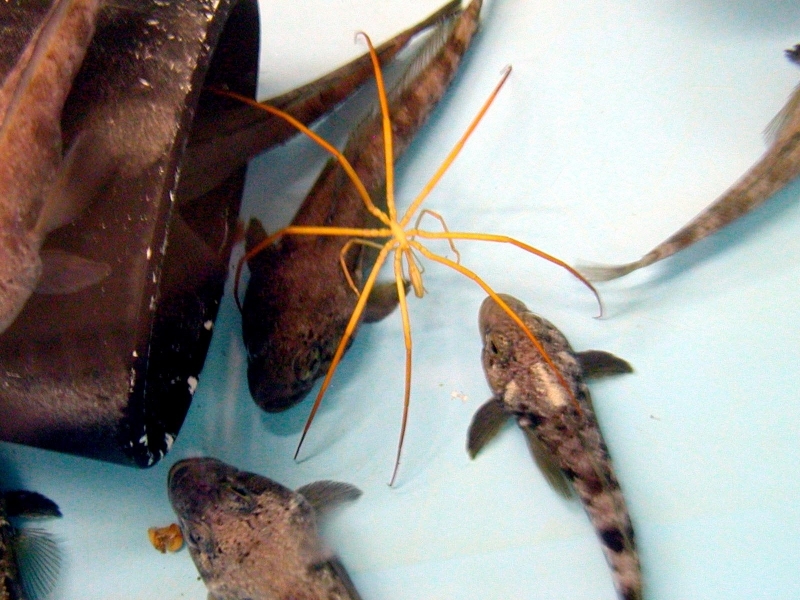 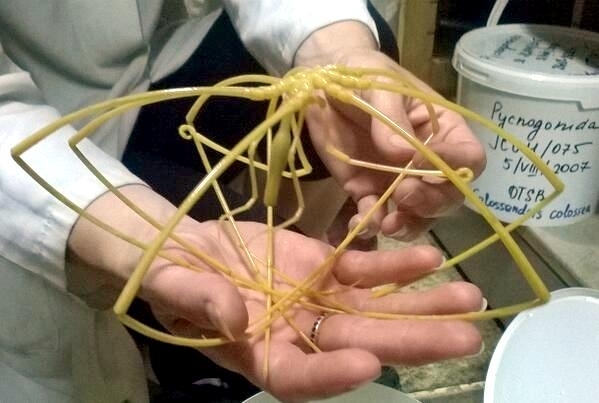 Collected from the Ross Sea Ice Shelf in southern Antarctica, a 9.8 inches (25 centimeters) Giant Sea Spider was one of 30,000 animals found during a 35-day field research census in early 2008. 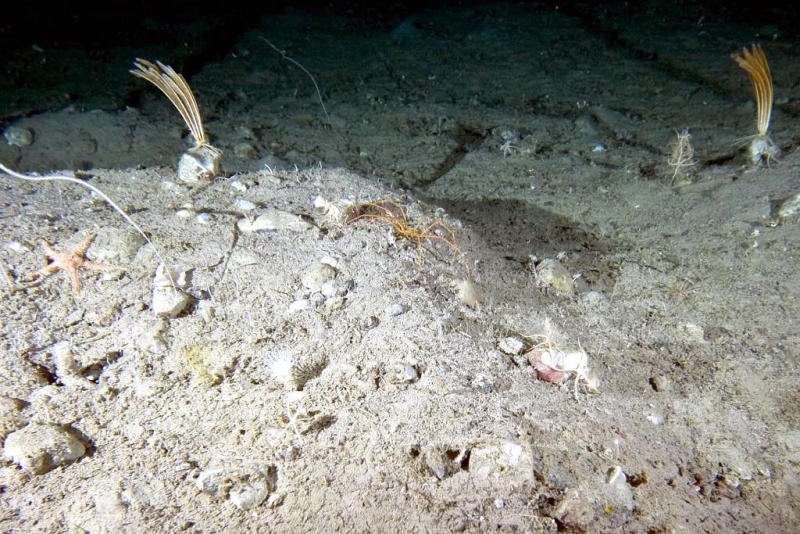 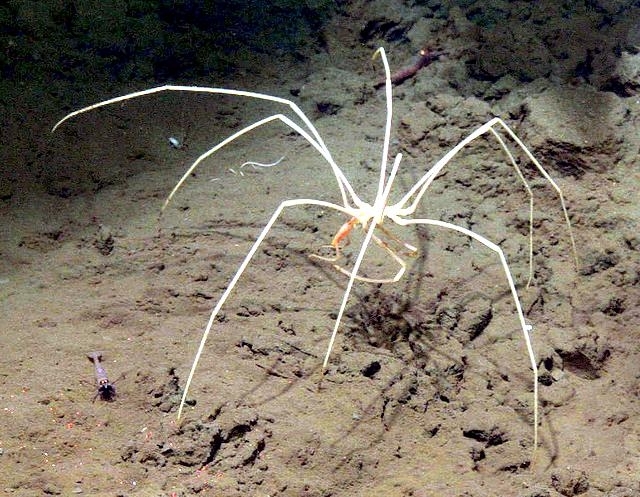 This creature was found 2,300 feet deep and was almost 3 feet. 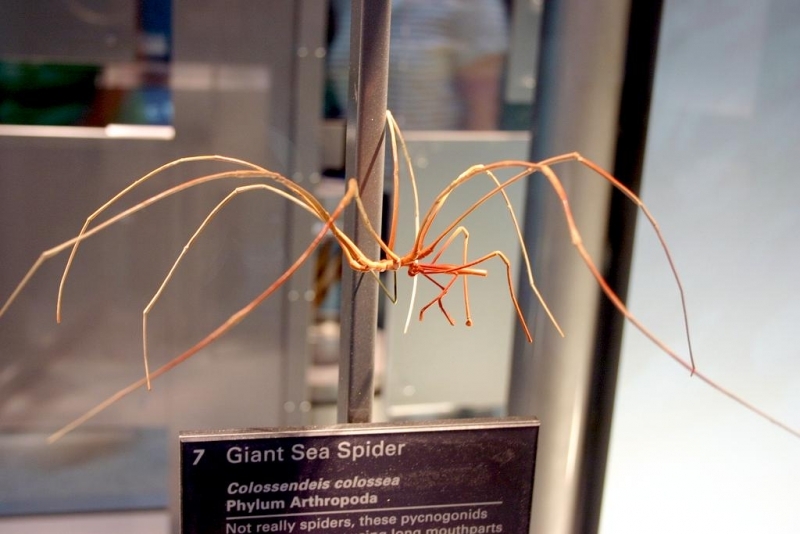 Their 8 long legs help carry vital organs like their digestive tract. 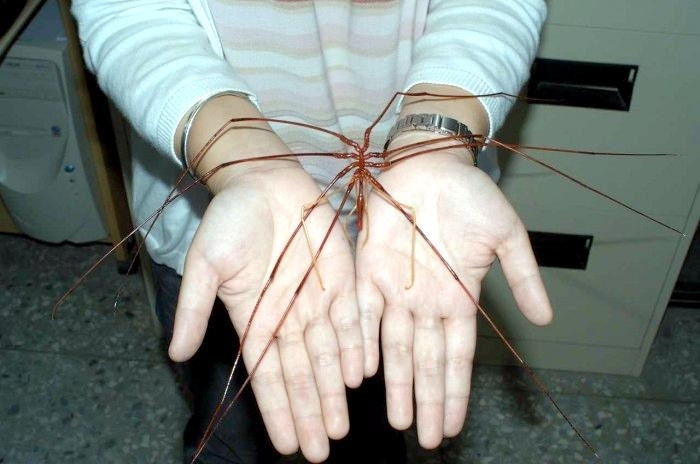 They also have 3 to 4 extra limbs used for cleaning, courtship and carrying their young. 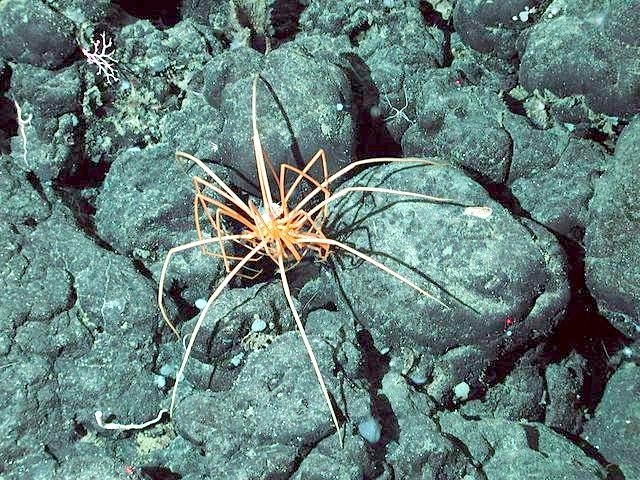 These marine arachnids, which prey on hydroids & bryzoans are larger and more common in Antarctic waters than anywhere else on Earth. 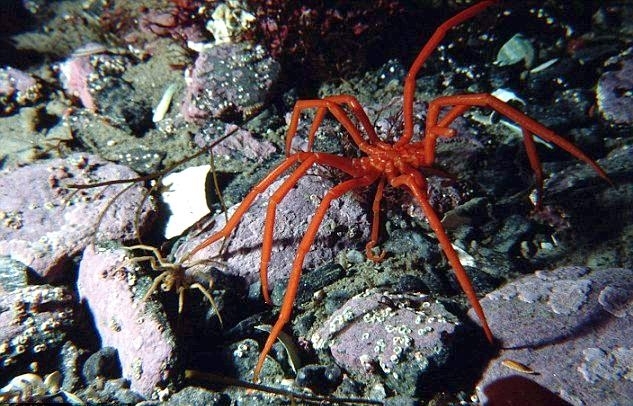 Polar gigantism does not just effect Sea Spiders but copepods, echinoderms and some types of mollusks have also been found to grow to larger sizes in the region. 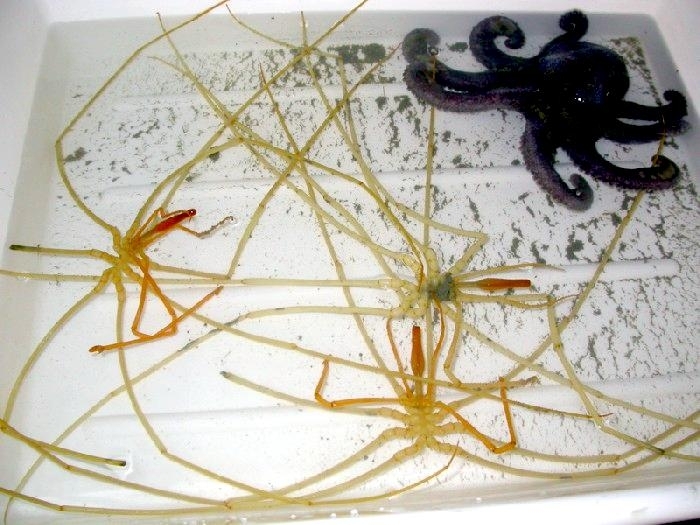 Just off the coast of Antarctica, oxygen content in seawater is especially high coupled with slowed metabolisms from cold temperatures, could have led Giant Sea Spiders to develop super-sized bodies. 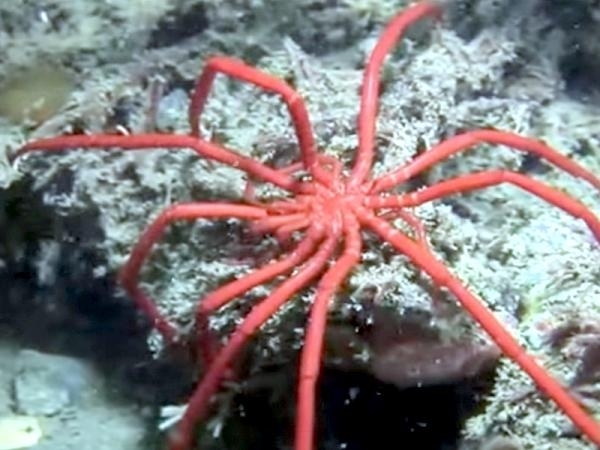 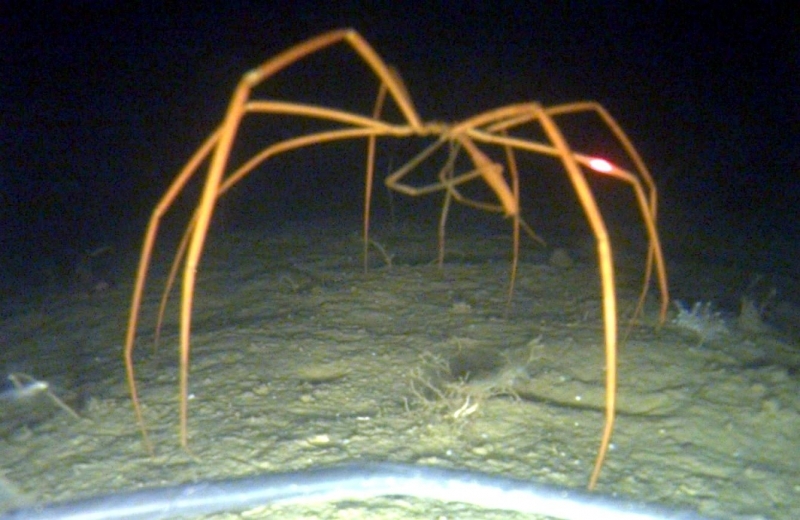 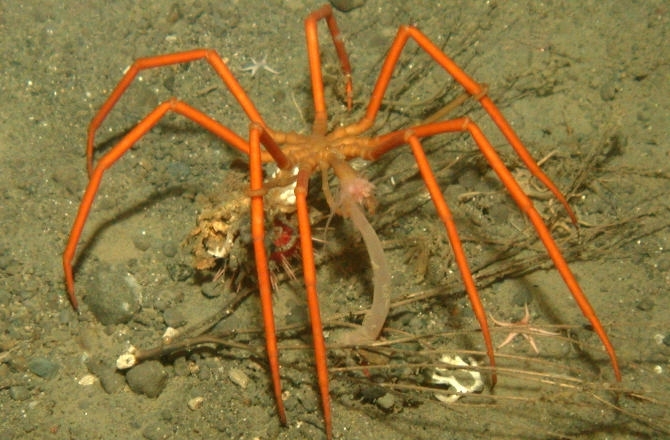 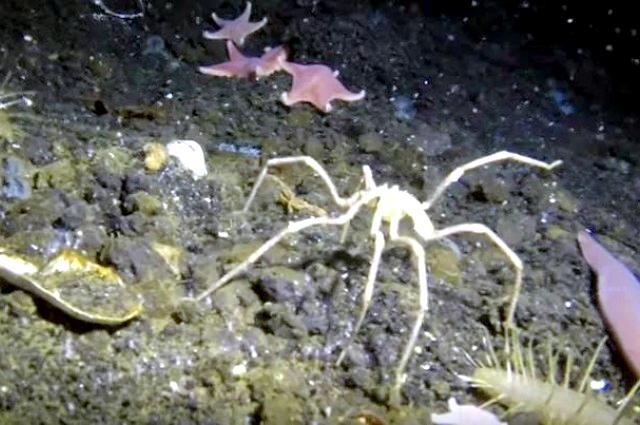 Reminiscent of something out of Star Wars with long skinny legs extending from a stick-like body, Giant Sea Spiders stroll across the ocean floor in search of a meal. 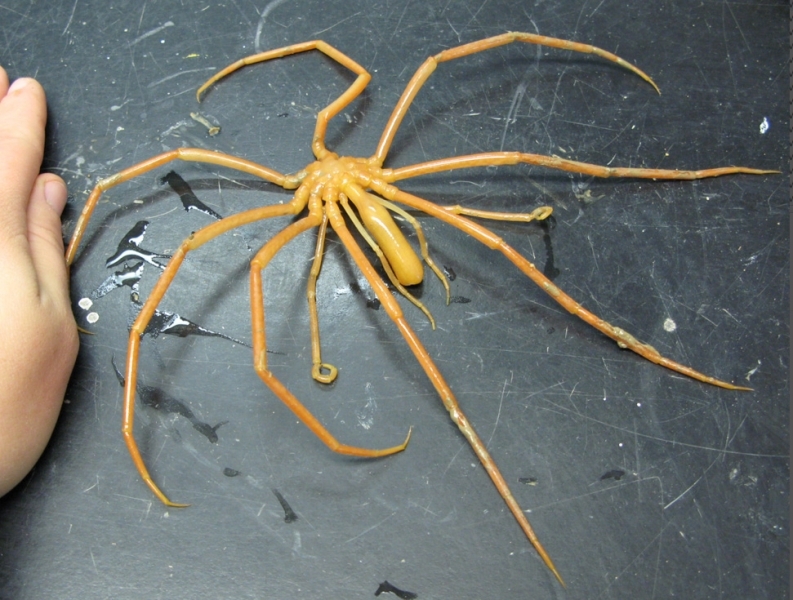 Although their exact classification has defied science for more than 100 years, the Giant Sea Spider is a true-blue arthropod known as a pycogonid. 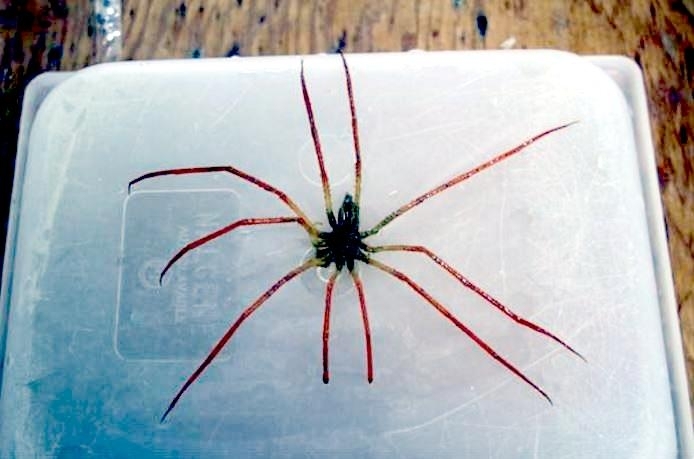 Its segmented exoskeleton shows that it is closely related to spiders living on land, although some types of sea spiders have 5 pairs of legs and not 4. 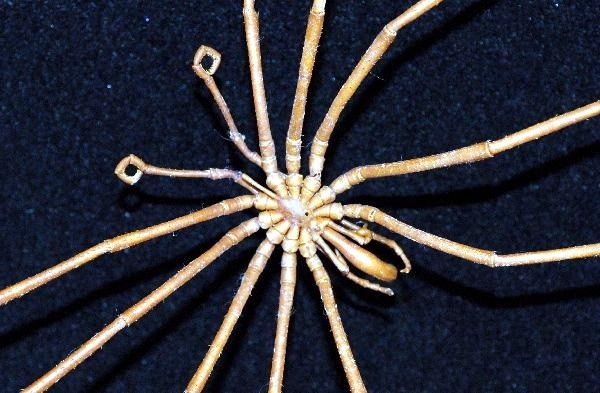 If you’re aching to encounter a Giant Sea Spider face-to-face, you’ll need to dress warmly. 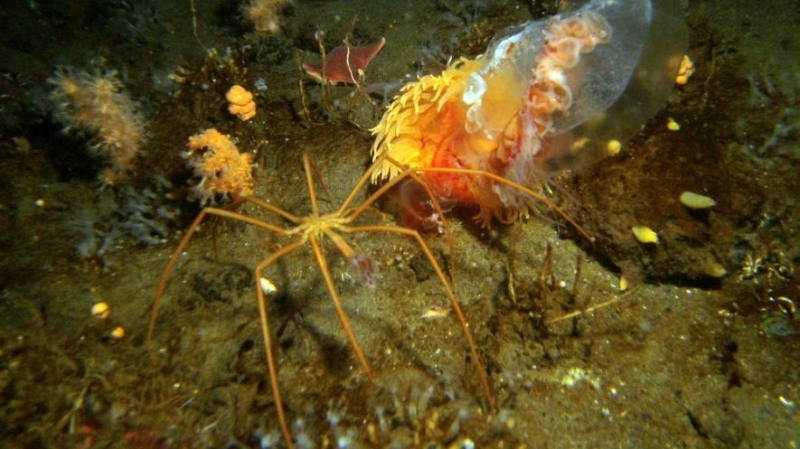 They are found in the frigid waters of the Southern Ocean, more than anywhere else in the world. 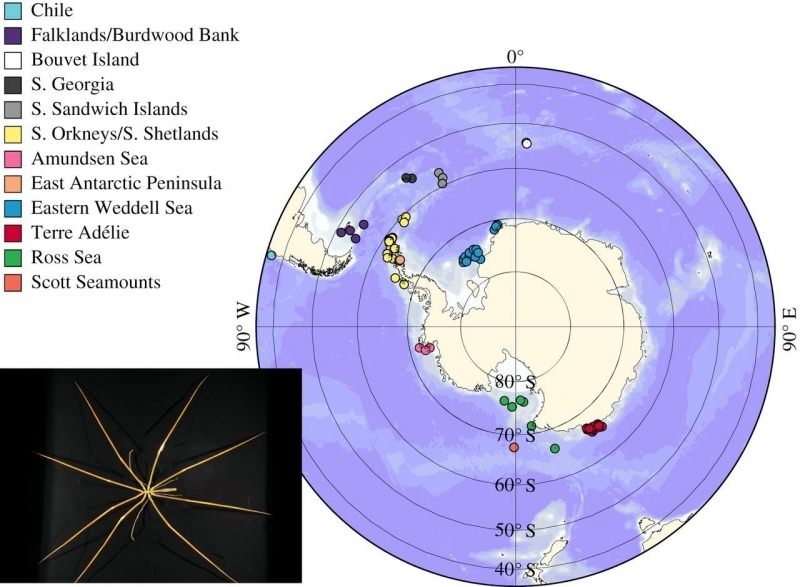 The cold waters surrounding Antarctica hold more oxygen than warm-water oceans and the Giant Sea Spider absorbs it through spores throughout its body, allowing it to grow to the size of a trash can lid. 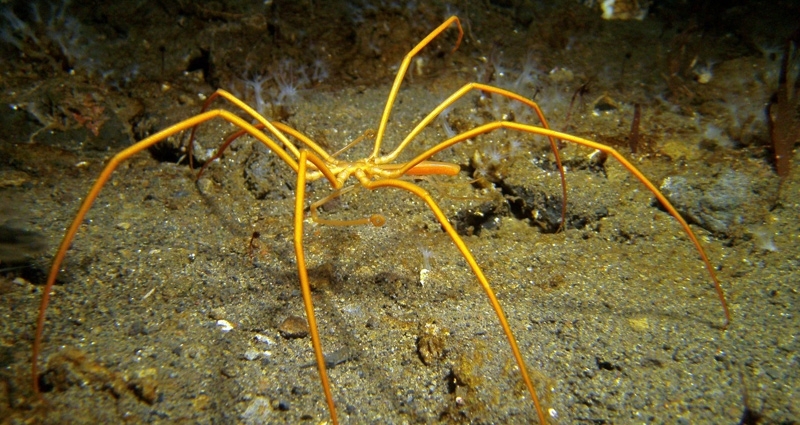 When a female Giant Sea Spider releases her eggs during mating, the male scoops them up, fertilizes them and cements them together with fluid from his body. 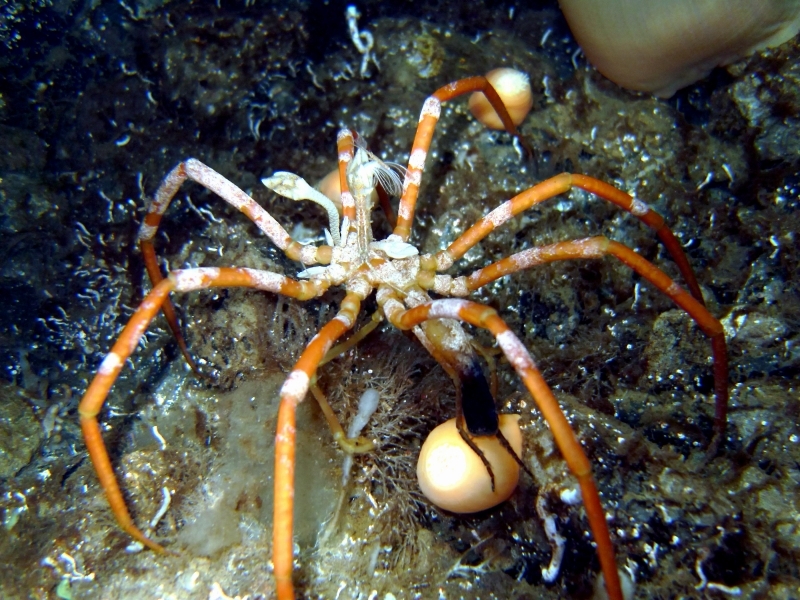 Far from being monogamous, the male may collect eggs from a half dozen females. 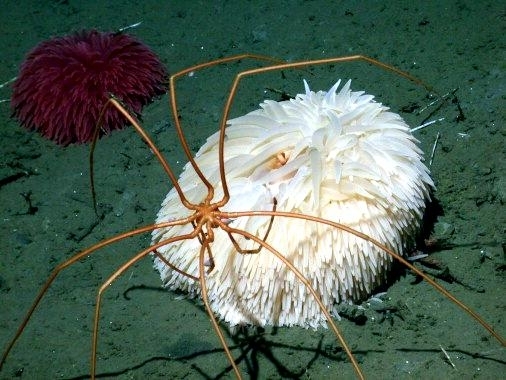 Once they are cemented, the male carries the balls of eggs under his body in structures known as ovigers until the eggs hatch. 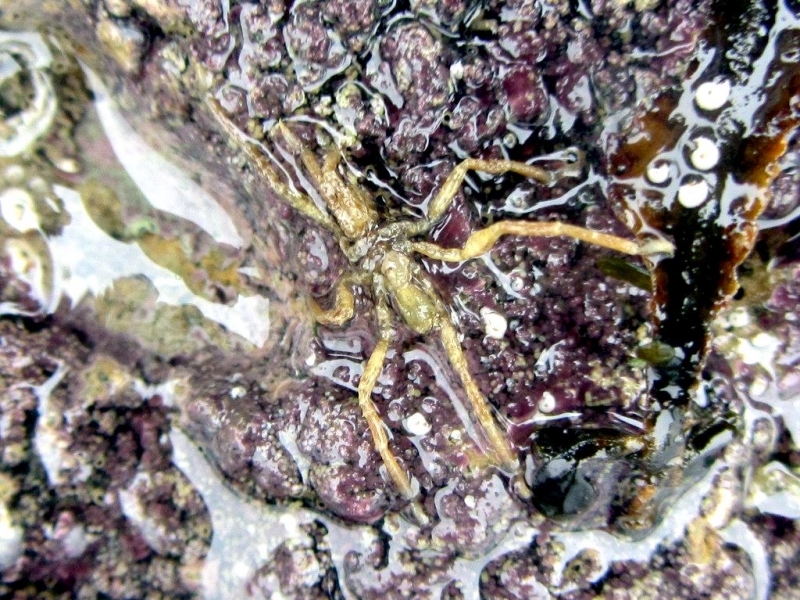 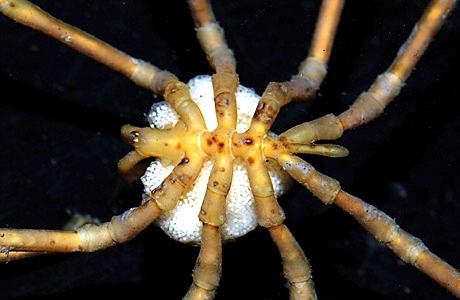 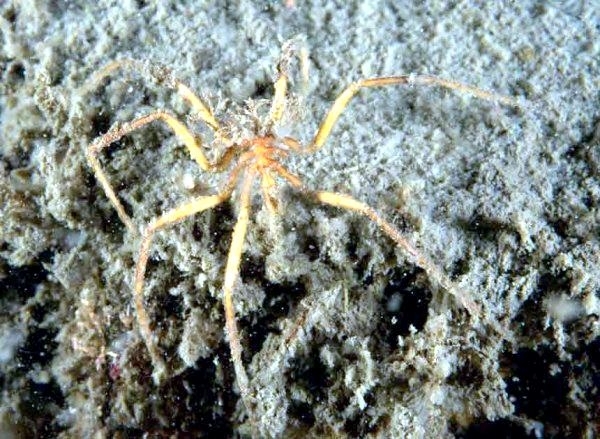 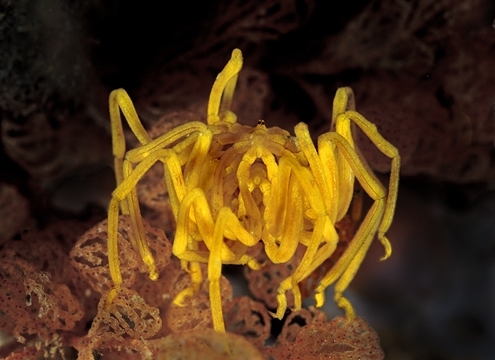 Giant Sea Spiders continue to carry hatched larvae during their early development before depositing them on a colony of soft coral where they’ll have sufficient food. 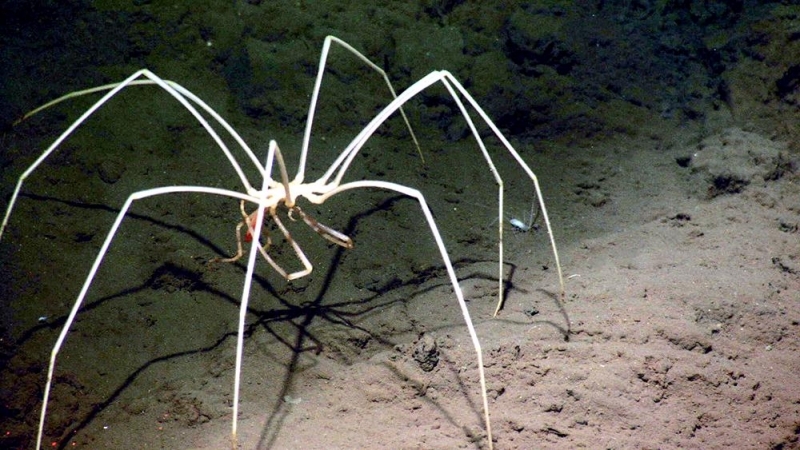 Most arachnids crawling on the land have 8 eyes, but you won’t find any eyes on the Giant Sea Spider. 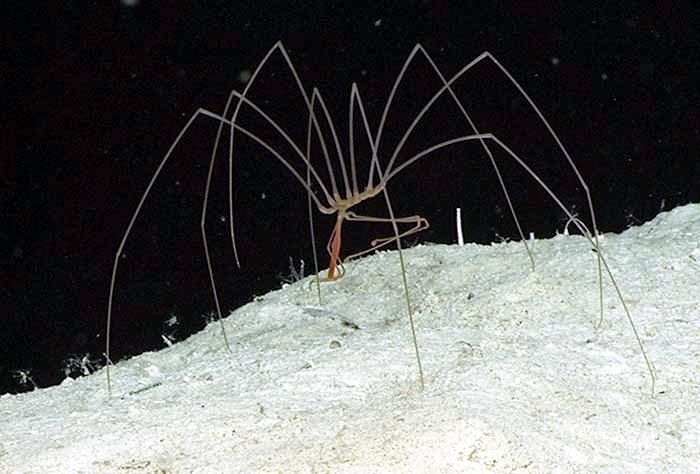 Crawling around in complete darkness, the Giant Sea Spider would not be able to see even if it had eyes. 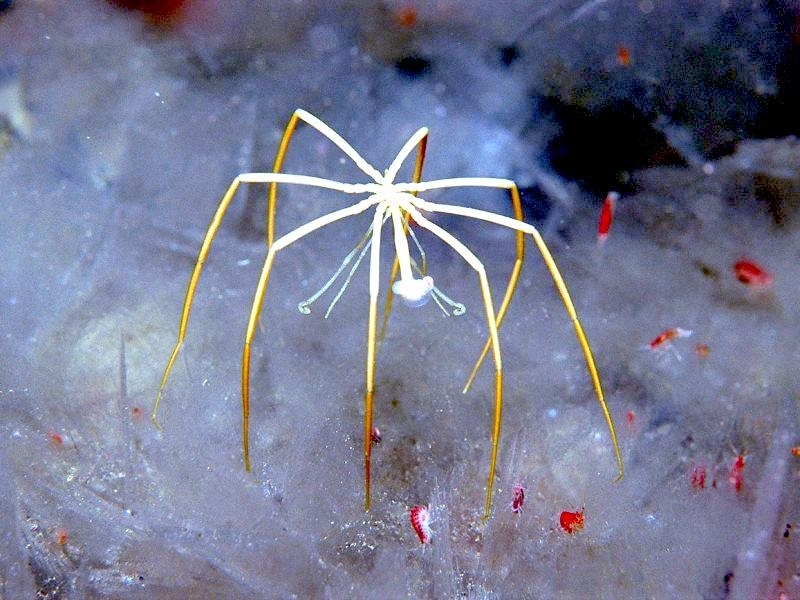 It uses instead, chemo-receptors on its antennae and elsewhere on its body to detect its prey chemically before sucking its vital juices with the mouth at the end of its long proboscis. 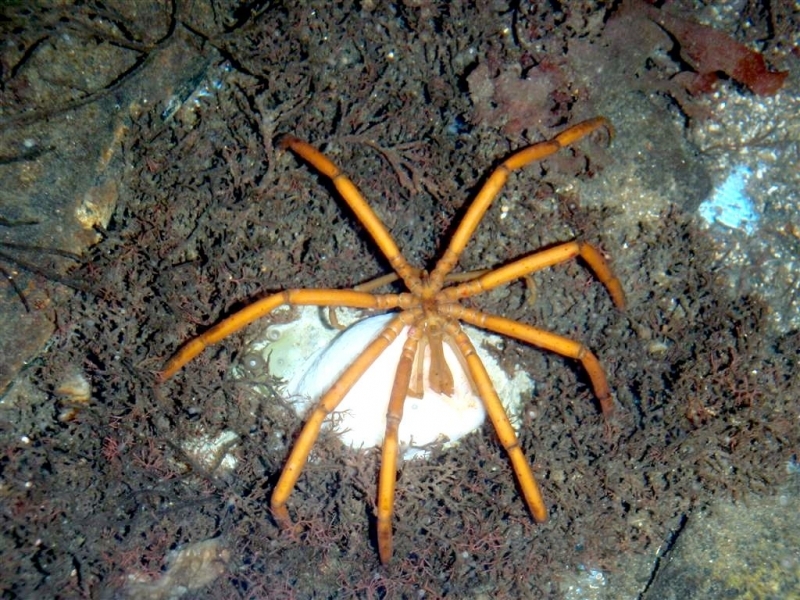 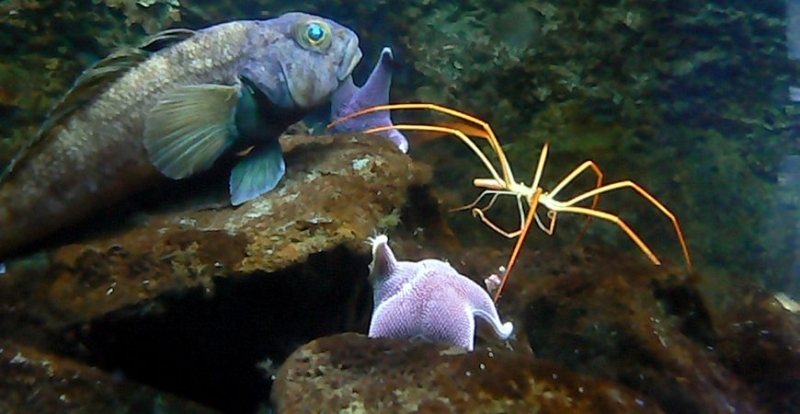 Favorite prey of the Giant Sea Spider are Sea Slugs as well as various sponges & soft corals.